Swimming is fantastic exercise for nearly all dogs, from puppy to geriatric, athlete to sofa snuggler, healthy to recuperating from surgery or physical ailment, four legged and amputees, dogs with arthritis, neurological issues, or who have dysplastic hips or elbows. It helps to build and maintain muscle mass, increase range of motion, improve circulation, relieve pain, stiffness and swelling, and provides mental stimulation. And of course, it is fun! The benefits of hydrotherapy also depend on how often and long the dog is in the water. For some dogs, simply floating or swimming gently in water can relieve pain and inflammation. For others, more vigorous exercise, and even manual assistance, is used to increase the use of limbs and range of motion (ROM), increase muscle bulk and tone, and strengthen support for joints. After surgery or injury, this can allow an earlier return to normal use. Depending on age and condition, as little as fifteen or twenty minutes might be enough in the water (over a longer period of time, with lots of breaks that may include massage). A very fit young dog might swim for thirty or forty minutes, depending on the activity in the water. 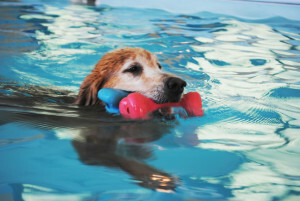 Geriatric and arthritic dogs benefit immensely from this form of exercise by being able to move easier in the water, exercise without impact to the joints, develop and maintain muscle mass, as well as range of motion. Even dogs with very limited hind end use on land are often able to mobilize their hind legs in water. Hydrotherapy can also increase cardiovascular fitness and help with weight loss. Puppies learning how to swim, fitness and conditioning swimming is a great FUN way to exercise and tire out your dog. Hydrostatic pressure – the pressure of the water on the limbs and body under water provides a support similar to an all-over support hose! This is particularly good for relieving any swelling, but because of this property of water, dogs with a respiratory or cardiac condition are not advised to swim due to the pressure against the chest wall. Viscosity – this property provides the resistance to movement – it gives friction. Water provides much more resistance than air giving us more exercise in a shorter time without overly stressing the joints with percussion. The resistance is on all planes of movement, so the dog is working multiple sets of muscles at the same time – each movement is concentric and eccentric. On land, gravity assists so the muscles are used more in one direction than the other. It also slows any ballistic movement, which decreases the chance of injury. Buoyancy – the force that allows a body less dense than water to float. This means that the effects of gravity are greatly decreased – the body’s weight is reduced by 75% – 90%, depending on one’s body type (density), and how deep one is immersed. (Muscle is denser than fat, which is why heavily muscled dogs are less buoyant.) This force allows dogs to exercise without putting weight or percussive stress on the joints.